This post is a little self indulgent, but still relevent, I hope. I was browsing through the Guardian long reads when I came across this article. As these articles are of course by nature long, I’ll summarise quickly. The article is about how the writer gave up his dream internship because he realised that he was being taken advantage of by being paid so little. 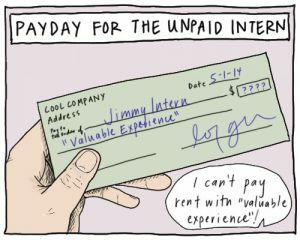 He mentions how businesses use unpaid interns to save on costs, while giving the intern some valuable experience and contacts within their chosen field. The only thing is, is that most people can’t afford to go unpaid for six months at a time, and the writer argues how these kinds of opportunities are only availible to people who are more financially stable. For example; people who still live with their parents or people with high earning partners who can support them both. The every day person who has to support themselves (like myself), no matter how great and beneficial the opportunity can’t justify not making money. Like a lot of issues in this country, the best opportunities only seem availible to the elite. I have highlighted in bold the sections of article 23 that I believe unpaid internships violate. 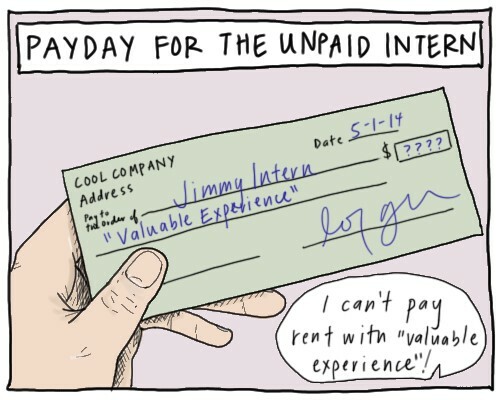 If everyone has the right to equal pay for equal work then internships (which from talking to my friends, can be incredibly hard work) then all internships should be paid at least the minimum wage. (Preferably the living wage!) Also, the original article is all about how the writer felt taken advantage of. Surely then this unpaid internship did not ensure him an existance worthy of human dignity? While I was researching I also found this interesting article about how the human rights sector themselves often exploit young people with unpaid internships. I’ve been looking for internships myself in similar sectors and I can account for this. Somewhat hypocritical of these organisations, don’t you think?